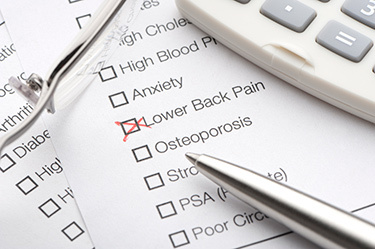 Home » Blog » Low Back Pain...When Do I Need to See a Spine Surgeon? In most cases, low back pain may be treated successfully without needing to undergo surgery. Non-surgical treatments such as pain medications, rest, icing for the first 48 hours followed by heat application, and physical therapy should be able to relieve low back pain within 2 or 3 weeks and allow return to routine activities. If your low back pain persists longer than 3 weeks, is accompanied by abdominal pain, loss of bowel or bladder function, unexplained fever or weight loss; and weakness, numbness, or tinging in the legs, you may need to see a spine surgeon. Specialized imagining studies and diagnostic procedures, such as an EMG, may be used to accurately diagnose the underlying cause for your low back pain and determine how best to treat it. Treatment options such as epidural steroid injections and facet joint injections may sometimes be recommended. You may also benefit from a customized physical therapy rehabilitation program or acupuncture. Low back surgery is usually advised if an anatomical abnormality is causing spine instability or spinal nerve compression. Lumbar decompression surgery may resolve pain and altered sensation in the leg that is caused by a pinched spinal nerve. The can be done using minimally invasive approach enabling faster return to activities of daily living, which can be between 1-3 weeks. Spinal fusion may be required to resolve low back pain caused by spinal instability. Recovery from spinal surgery may take 3 months to about to a year. Patients may elect to undergo the procedure if their pain symptoms are unbearable. Low back surgery is usually an elective procedure, but in rare cases such as sudden loss of bowel or bladder control or abdominal and low back pain suggesting the presence of an abdominal aortic aneurysm, emergency spine surgery may be required. If you are suffering from low back pain that has not resolved despite rest and conservative treatments, you should consult your doctor or a spine surgeon for an evaluation and treatment recommendation.